Succour has come the way of 300 people living with Sickle Cell Disorder in Lagos as they received free self-care tool kit from TonyMay’s Foundation, a non-profit organisation to protect them against the crisis associated with the busy Christmas and New Year celebrations. 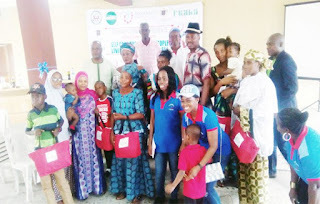 In his remarks at the presentation ceremony of the self-care tool kit to beneficiaries recently, at St. Joseph Mission Clinic, Kirikiri Town, Lagos, Mr. Andrew Otokhina, Chairman Board of Trustees, TonyMay’s Foundation, said that the goal of the exercise was to make sure that people with SCD are healthy and crisis free during the festive period. He said that the gesture is in line with the vision of the Foundation which is to have a sickle cell free nation and advocate for a sickle cell policy in the treatment and management of sickle disorder in Nigeria. The Chairman further stressed the need for increased awareness about the disorder through various campaigns and implementation of a sickle cell policy through legislation. He also said that the event is part of the strategies to engage communities and populace on the need for a collective effort in the fight against SCD which is endemic in the country. Government’s support for persons living with sickle cell is critical to the reduction of the burden of the condition in the country, he added. He observed that the foundation was established in the honour of his two children whom he described as ‘Warriors’ who died from sickle cell disorder. On her part, Winifred Otokhina, Legal Coordinator, said that the foundation was borne out of the urgent need to create awareness about sickle cell disorder (SCD) and address the lack of proper health management of the disorder in Nigeria. She also said that the foundation is addressing the major factors that are contributing to the number of new recorded cases of the SCD which is ignorance about disorder and the importance of genotype especially for people in sub-urban and rural areas. The term sickle SCD describes a group of inherited red blood cell disorders. People with SCD have abnormal hemoglobin, called hemoglobin S or sickle hemoglobin in their red blood cells. SCD is the most common inherited blood disorder. That means it is passed down through families. You are born with SCD. It is not something you catch or develop later in life. Not enough oxygen in the cells of your body can cause a crisis, according to experts. Studies have also shown that shortage of oxygen during exercise, everyday stress among other factors, cause the shortage and the red blood cells to sickle. It is no secret that Nigeria has the world’s largest population of people with SCD. About 3.6 million – two per cent of the population are living with the disease, while over 1,500 babies are born with the condition every year in the country, according to Sickle Cell Support Society of Nigeria (SCSSN). At least 40 million Nigerians representing roughly 25 per cent of the population are currently believed to have the sickle cell trait or are carriers of the sickle cell gene (AS).